Messages : MARCELA MORAGA M.
Intervention organized with a recycling association of women. They collect mostly non-returnable PET plastic bottles in the town. These bottles are also found in large quantities in the river. 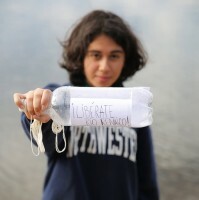 The Renaico community was invited to write letters to the river and to slip them inside PET bottles. Then, the bottles were hung from the bridge, so that all the people could see them. In this way, the bottles were close to the river but not inside it. The letters - messages could also be read from the bridge during two days. 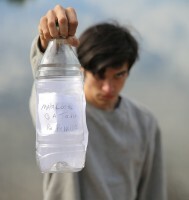 The bottles are now part of the collection of the museum, together with a video documentation of this performance.